Late September 2018 will see the start of an exciting project funded by the Critical Ecosystem Partnership Fund (CEPF) into the Comoros Archipelago. The Comoros coral reefs are an unrivalled marine paradise, with the highest concentration of coral marine species within a small area, in the world. Comoros offers one of the world’s largest coral atolls which parades hundreds of fish species, shells, and corals. The research team aims to study the marine biodiversity and fish abundance in the deeper (benthic) ecosystems in the Comoros. Research will be led by chief scientist Melita Samoilys, Director of Coastal Oceans Research and Development in the Indian Ocean (CORDIO), a well-known Kenyan NGO, specialising in generating knowledge to find solutions that benefit marine ecosystems and people. The deeper habitats that this project will focus on are unexplored and unknown and need protection. “We will be exploring the unknown areas to understand where the sensitive areas are and where the protection should be. We look forward to working with the University of Comoros and the Fisheries Directorate scientists and their students in the Comoros Archipelago, looking at their deeper habitats, deeper than 40 metres. This study will be important for sustaining inshore fisheries, as well as climate refuges,” said Dr Jean Harris, Executive Director of WILDOCEANS, a programme of the WILDTRUST. The Critical Ecosystem Partnership Fund (CEPF) is a joint initiative of l’Agence Française de Développement, Conservation International, the European Union, the Global Environment Facility, the Government of Japan, the MacArthur Foundation and the World Bank. A fundamental goal is to ensure civil society is engaged in biodiversity conservation. CEPF through WILDOCEANS, will work to empower the Comoros Archipelago science fraternity to understand the nature and distribution of benthic ecosystems and the coral reefs, and how to protect them. “Biodiversity is an essential part of a planet that supports more than 7 billion people,” said Olivier Langrand, Executive Director of CEPF. “The efforts of the WILDOCEANS project partnership to better understand and ultimately protect biodiverse ecosystems such as the coral reefs of the Comoros are of the utmost importance. The vital services such ecosystems provide, for example as a refuge for fish species, make this type of research an investment in a healthier future for oceans, for the people of Comoros, and for everyone. We also value the fact that this project is implemented by experts from the region in a spirit of cooperation.” To date, CEPF has contributed substantially to the protection of areas around the world. 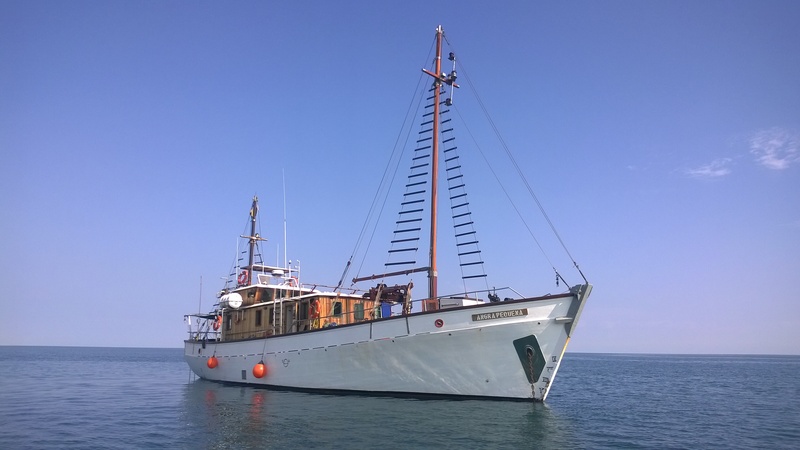 Local scientists and students, primarily from the University of Comoros, will contribute to gaining insights into conducting fish community surveys around the island on board the WILDOCEANS’ oceanic research vessel, the RV Angra Pequena. The project seeks to achieve impact in four areas, namely, biodiversity knowledge improvement, enhancement of civil society capacity, improved human well-being and creation of enabling conditions for conservation. The research expedition will work to empower the Comoros science fraternity to achieve these four areas. When asked about the exciting opportunity that awaits these students at the University of Comoros, Nirina Rasoanandrasana, a lecturer at the university responded saying, “This is a great opportunity for us to meet scientists in the marine environment, and to engage in an exchange of research and communication. Comoros relies on subsistence fishing, which is contributing to the country’s developing economy. This project will adequately equip us to teach our communities about protecting our precious ecosystems and the parts of it that are unknown, as well as fishing sustainably in a way that will not harm the very ecosystems we aim to protect”. Nirina, who is also a biologist and oceanographer, will be part of the science fraternity joining this expedition. To include the local community members, opportunities will be created to take some fisheries department researchers and representatives of fisher communities to sea, so they can witness the surveys of the ecosystems and benthic fish species through visual means first-hand. While the main aim is to significantly advance scientific knowledge about nature and the condition of these important habitats, it is also important that local community members are well acquainted with their surrounding environment, by being made aware of marine biodiversity and its value for sustaining human well-being and livelihoods. Beyond that, two local community development organisations, UMAMA and AIDE, will communicate biodiversity conservation and fisheries sustainability principles to school children and local community stakeholders. “An opportunity like this is not only exciting for our organisation, but also for the communities where we are involved. Our communities are willing to learn, and this collaboration will help us to educate and empower them even more”, said Faouz Fardani, Head of Communications at UMAMA. This project possesses unique and exciting qualities. Scientists and local community members in Comoros will be empowered and equipped to continue the work long after the expedition ends. Various students from the University of Comoros will be trained to use various pieces of equipment, including baited remote underwater videos (BRUV) – some of which will be left with the team in Comoros to use for further research and exploration. The RV Angra Pequena set sail for the Comoros expedition on the 24th of September 2018.